Most of our resources are downloadable. Our new Sparky Rewards range is going to be a series of rewards for your class that we have had printed. We started off with these VIP cards and our intention is to slowly increase the range over time. The aim of our VIP cards is to reward some of the things that we think matter. POP-UP OFFER: Currently, all schools or individuals who order 1000 cards and who pay via the Paypal button on this page will get £20 off. Please note this offer does not apply to invoiced cards. REMEMBER - as with all our other cards, if your school orders 1000 or more, we can personalise them for you (school colours, badge, different wording, you name it). For example, King's Lynn Academy personalised their VIP cards to feature their school name (in their own font) and changed the character traits on the back to balance their existing reward scheme. If you're interested in personalising your cards, you can find out more here. 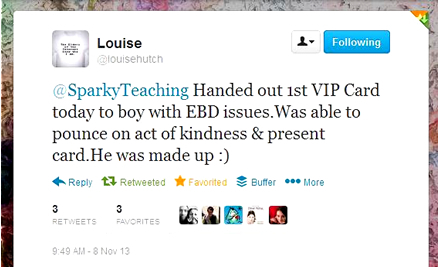 'Sparky VIP Rewards' are copyright Sparky Teaching 2013.